The Supplier of the Year Award is an honor and we’re appreciative of this recognition, as well as the privilege to be a resource to the broadcast and wireless interest in South America. The Mexican Association of Broadcast Engineers and Technicians (AMITRA) recognized LBA Technology, Inc., its CEO, Lawrence Behr and the company’s International Sales Representative, Javier Castillo with the Supplier of the Year (AMIGO Proveedor Del Año) Award. 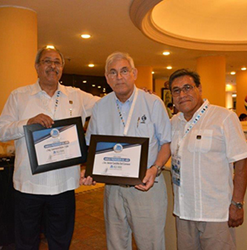 Aurelo Jasso, AMITRA Secretary presented the awards at the 41th International Congress of Broadcast and Telecommunications held August 23 – 26 in Acapulco, Mexico. The annual gathering is organized by AMITRA. “You are an example of an honest supplier within the Association and we want to point this out to all suppliers to follow your exemplary behavior and learn the ethics and philanthropy you demonstrate,” AMITRA president Fernando Caballos said. “We know that Companies need to make money and be successful, but we thank them when they show human qualities.” Caballos added. Through the years, LBA has supported the endeavors of AMITRA. One such example is the company sponsoring and presenting the Engineer of the Year Award at the annual Congress for the last 15 years. The honor and monetary award recognizes the merits of a member of AMITRA in his or her performance as a radio engineer. For over two decades LBA has been a pioneering provider of RF equipment and RF safety training to markets in Latin America though LBA Technology, Inc. and LBA University, Inc. LBA products and services have provided countless critical solutions for the Latin American broadcast and telecommunications sectors. LBA has worked to develop strong relationships and a unique understanding of the market. “The Supplier of the Year Award is an honor and we’re appreciative of this recognition, as well as the privilege to be a resource to the broadcast and wireless interest in South America,” Castillo said. Learn more about LBA, it’s products and solutions at http://www.lbagroup.com. Contact Javier Castillo at 252-757-0279, jcastillo@lbagroup.com for more information about LBA Technology, Inc. broadcast products. LBA Group, Inc. has over 50 years of experience in providing technology and risk management for industrial and telecommunications infrastructure assets. LBA is a multiple INC5000 awardee, and is a North Carolina Top 50 Hispanic minority-owned business. The group is comprised of LBA Technology, Inc., a leading source and integrator of radio frequency systems, lightning protection, and EMC equipment for broadcast, industrial, and government users worldwide; the professional technical consultancy Lawrence Behr Associates, Inc.; and LBA University, Inc. providing online professional training. The companies are based in Greenville, N.C., USA. Keep up with what’s going on at LBA by following the company on Facebook and LinkedIn.